The Walpole Footlighters have been offering great community theatre performances since 1924. As the first play in their 2018–2019 Murder, Mystery, and Mayhem season, "Flemming (An American Thriller)" was presented on several dates in October and will be presented on Nov. 2 and 3 at 8 p.m. and Nov. 4 at 2 p.m. Grab a ticket, and you’ll enjoy a professionally presented classic farce in a cozy, comfortable theater, while staying close to home! 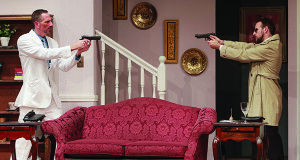 All of the action in "Flemming (An American Thriller)" takes place in the Westport, Connecticut living room of Henry and Karen Flemming, a wealthy couple with a comfortable lifestyle. The detailed set includes French doors leading to a patio, a table and chairs, a sofa, and a well-stocked bar. There are also surprises built into the set, which shall remain a secret. Henry announces to Karen that he sold his investment firm and bought a private investigation business. He wants more excitement. He is bored with the sameness of his work responsibilities and the predictability of his life. Karen, on the other hand, relishes the sameness of her life that is filled with shopping, sipping cocktails, dining at the club with friends, and arranging to keep their two children on the go and out of their hair. She doesn’t want her perfect life to change, but soon her posh living room decorated with her beloved expensive things is host to dead bodies, men holding others at bay with guns, and all manner of crazy situations. Through it all, Karen maintains her civility, offering endless cocktails to “guests,” regardless of the circumstances. Diana Doyle, as Karen Flemming, keeps the audience laughing with her gift for timing and her high-pitched reactions to her husband’s choices and actions. Gary Mlinac, as Henry Fleming, flies on and off the stage, as an overconfident, newly minted PI, getting deeper into trouble. Ann-Marie Weaver, as Susie Spencer, expertly flings hilarious sarcastic comments at her husband, psychologist Stan Spencer, played by Jim Cannizzaro. Stan annoys everyone with his unfounded self-confidence, off-the-mark theories of human behavior, and unwanted friendly overtures. Hilarity ensues. For a good laugh and an enjoyable time, spend an evening with the Walpole Footlighters.